Okayama is a city where history meets modern technology. It originated as a castle town during Japan’s Edo Period, which spanned from the early 1600s to mid-1800s. Today, Okayama is the second largest city in the region, being somewhat smaller than Hiroshima. It is a railroad transportation hub, located at the junction of the Sanyo Shinkansen Line to Shikoku’s only rail connection. What is there to see and do in Okayama and the surrounding cities? How do you get there from popular destinations such as Tokyo and Kyoto? Consider this helpful travel guide. You may arrive in Okayama by air at the Okayama Airport (OKJ). The airport is located about 35 minutes north of the city center when traveling by direct buses connecting with Okayama Station. 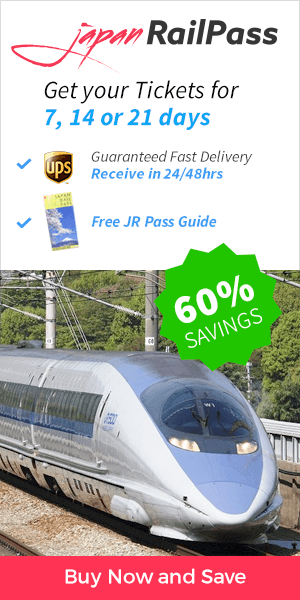 If you are arriving from another city, travel by train is simple using the Japan Rail Pass. From Tokyo to Okayama. From Tokyo Station, take the Hikari train on the JR Tokaido/Sanyo Shinkansen Line to Okayama Station. The trip takes about four hours and is fully covered by the Japan Rail Pass. From Kyoto to Okayama. From Kyoto Station, take the Hikari train on the JR Tokaido/Sanyo Shinkansen Line to Okayama Station. One such train departs from Kyoto each hour, and the trip takes about 90 minutes. It is also covered by the JR Pass. From Osaka to Okayama. If traveling from Osaka, you will also take the JR Sanyo Shinkansen Line. The trip from Osaka Station to Okayama Station takes about 45 minutes. The Hikari train is covered by the JR Pass, and additional trains may be covered by other area-wide passes. From Hiroshima to Okayama. From Hiroshima Station, take the JR Sanyo Line to Okayama Station. This trip takes around three hours and 15 minutes and is covered by the JR Pass. You’ve seen how easy it is to arrive at Okayama using the Japan Rail Pass. You might also consider the Sanin Okayama Area Pass. This four-day pass costs ¥4,500 – half this amount for children under age six – and allows unlimited travel on JR trains in and around Okayama, as well as the non-JR Chizukyu Express Line. For travel around the city, the Sanin Pass also offers free bicycle rental from Ekirin Kun outlet stores, and discounts on admission to such attractions as the Korakuen Garden and Okayama Castle. Two tram lines, the Higashiyama and Sekibashi, depart from Okayama Station. Within the city, these cost a flat rate of ¥100 per ride; the trams may be covered by some local passes. When taking the Higashiyama Line, consider stopping at Shiroshita. Many of the best attractions in Okayama are situated within a 15-minute walk from one another, and they are within walking distance of this stop. Several bus lines also operate within the city. The Korakuen Garden, a famous Okayama garden, and park, is ranked among the three best Japanese gardens. 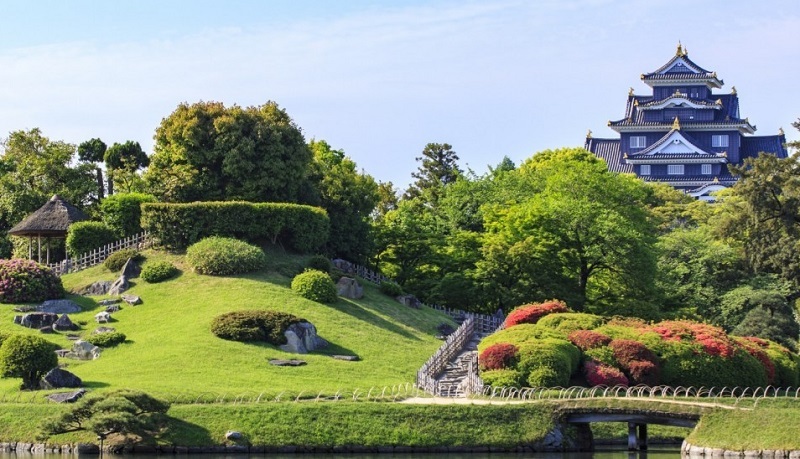 The landscape garden spans both sides of the waterway known as Asahi-gawa. The nearby Okayama Castle provides the backdrop for the popular Japanese fairy tale Momotaro, or “the Peach Boy,” and references to this legend can be seen throughout the city. The reconstructed castle, also known as the “crow castle,” was originally built in 1597, and rebuilt in 1966. The main building contains a museum. Another outdoor activity is the Kibi Plain and cycling route. This scenic bicycle road winds through rural land dotted with historic sites, temples, shrines, and farms. If you will be traveling in the region for a number of days, consider a visit to nearby Himeji, Hiroshima and Miyajima, or Naoshima Island. At Himeji, you will witness the beautifully restored White Heron Castle. Hiroshima is known for its Peace Memorial Park and Museum, the UNESCO World Heritage Site which marks the location of the destructive atomic bomb unleashed on the city during World War II. Miyajima, or the “shrine island,” is a spiritual retreat famous for its mountainous beauty and “floating” torii gate. It is also a World Heritage Site and has been considered one of the Three Views of Japan for nearly 400 years. Naoshima Island is known for its unique art installations and museums such as the Chichu Museum, Benesse House museum and hotel, Lee Ufan Museum, Ando Museum, and Art House Project. Finally, you can take the JR Marine Liner to Takamatsu and Shikoku island, via the Great Seto Bridge. With a top speed of 130 km/h (80 mph), the full journey from Okayama to Takamatsu takes approximately one hour. Where will your travels take you? Whichever sights you choose to visit, your trip to Okayama is certain to be a memorable one in this region rich in history and culture.